Juicing fresh fruits and veggies has become very popular the last few years. The physical and mental stresses of modern life coupled with environmental toxins have lead to an increase in obesity, lifestyle diseases, heart disease and cancers. Many diseases are linked to an unhealthy diet, high in processed junk foods and also due to lack of exercise. The government now recommends that a person should have at least nine servings of fruits and vegetables in a day for good health. This can be difficult for most people to follow. This is where juicing can come to the rescue! Fruits and vegetables can be easily juiced to make highly nutritious juices that enable you to meet your daily requirements of fruits and veggies. If you only drink juice on occasion or even consider a breakfast juice a must-have, juicing can open your eyes and change your health! Juices that are high in phytonutrients, vitamins and minerals can help your body fight disease, improve immunity and health, provide greater levels of energy and even help you lose weight. Here are 5 ways you can use juicing in your life. Thanks to juicing you can enjoy the beneficial nutrients of different fruits and veggies at the same time. There are many fruits and veggies you may not like for their taste or flavor, but when they are blended with other produce, they actually taste great! You can use cheaper fruits and veggies as a base for your juice and add smaller quantities of expensive ones. In this manner, you don’t go over-budget and also enjoy the benefits of fresh juice. 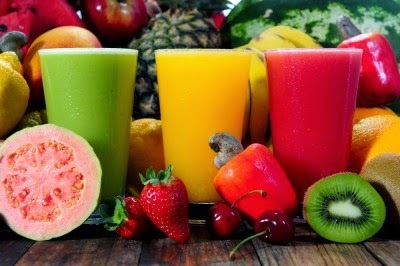 Juices are mainly made up of water. Many people simply don’t like to drink water or don’t drink enough water. Instead of water, they may drink sodas, beverages and alcohol. Juices can easily take the place of water, keep the body hydrated, eliminate toxins and ward off disease at the same time. Digestion is a complicated process and if your digestive system does not work very well, juicing can help you get all the nutrients you need easily as juice floods your body with bioavailable nutrition. If you regularly take antacids or have digestive problems, juicing helps you overcome these problems, while giving you much needed nutrition with all its health benefits. Cooking destroys many vitamins and minerals in the foods. Many of these nutrients are killed by water and heat. Since you have raw fruits and veggies in the form of juice, you get all the nutrients that are in them in their natural state. It always a good idea to have your first glass of juice on an empty stomach in the morning. Apart from that, you can have juice at any time, with your meals, in place of a meal or when you need a quick pick-me-up. Drinking a glass of juice is quick and easy and every time you have a glass of juice, you are getting a whole lot of nutrients, vitamins and minerals. Which is the best source. Tip: Check the labels on packaged and bottled juices. They have a lot of added processed ingredients, preservatives, sugars that reduce their nutritive value. It's better to try to invest in a best juicer or blender and juice your way to good health. Try these juicing recipes from "Superfood Smoothies: 100 Delicious, Energizing & Nutrient-dense Recipes" to get you started on your way to good health.